Macrolane VRF-20 10ml is similar to a dermal filler, but instead of filling and enhancing the face, it is meant to be used on other areas of the body requiring large amounts of volume. Buy Macrolane VRF 20 10ml from PDCosmetics to fill body indents or scars, or to enhance areas such as the buttocks, calves, and pecs. 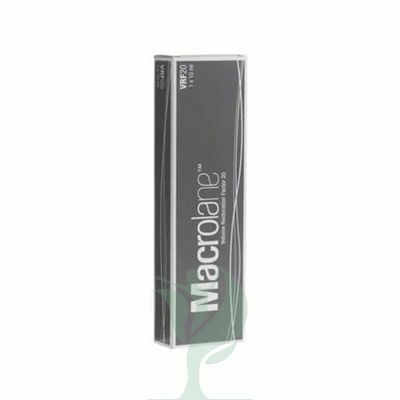 Macrolane is similar to Restylane in that it is made with Non-Animal Stabilised Hyaluronic Acid (NASHA), however the hyaluronic acid in Macrolane is thicker and more viscous. This makes Macrolane VRF-20 a more appropriate treatment for areas other than the face that require the addition of large amounts of volume. Sometimes aging, injury, liposuction, or an original body shape can leave someone with areas that are hollow or indented, or with large scars. When you inject Macrolane VRF-20 10ml into these indented areas, the hyaluronic acid binds water and fills the hollow area beneath the skin, making the skin above look smoother and more even. You can even inject Macrolane VRF-20 into areas to give them more volume, such as the calves, buttocks, or pecs, enhancing the shape of these areas and adding definition. Although plastic surgeons had been injecting Macrolane VRF-20 10ml into women’s breasts, to give them more volume and firmness, many have now stopped doing this because of concerns from radiologists. The concern is that the hyaluronic acid in Macrolane could hide abnormalities such as lumps on mammograms, making it more difficult to diagnose problems such as breast cancer.